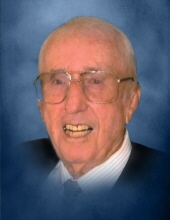 James “Jim” Luther Hobson, age 93, Carthage, MO passed away Monday, June 11, 2018 at Mercy Hospital Joplin, MO. He was born on January 12, 1925 in Cardin, OK the son of Luther and Hazel Hobson “Dunn”. Jim was a 1943 graduate of Carthage High School. He was a veteran serving his country during WWII in the United States Navy. He married Wanda Hensley on March 30, 1948 in Pampa, Tx, she preceded him in death on July 3, 2008. He then married Judy Williams on October 10, 2009. Jim went to work as a mechanic for Western Airlines in 1947 then as a pilot in 1951, he became Captain in December of 1957 until his retirement in 1985. He and Wanda returned to Carthage, MO in 1991. Jim truly loved flying and golfing. Jim was preceded in death by his parents, and a sister. Survivors include his wife Judy; a daughter Susan Olinger and husband Neil of La Mesa, Ca; a step daughter Tracy Garber, granddaughters, and great grandchildren. Funeral service will be held at 10:00 am Saturday, June 16, 2018 at the Knell Mortuary. Private graveside service will be held at Dudman Cemetery. The Family suggests contributions to a charity of one’s choice and may be left in care of the Knell Mortuary. Online condolences may be expressed though www.knellmorutary.com. To send flowers or a remembrance gift to the family of James Luther Hobson, please visit our Tribute Store. The Family suggests contributions to a charity of one’s choice and may be left in care of the Knell Mortuary. "Email Address" would like to share the life celebration of James Luther Hobson. Click on the "link" to go to share a favorite memory or leave a condolence message for the family.